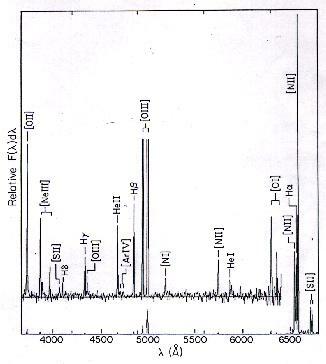 The major extensive research area involved the measurement of the chemical compositions of the nebulae, including those in other galaxies for which we know the distances and can have some idea of the positions of the central stars on the log L-log T plane. In this work, enrichments of particular elements were compared to theoretical predictions as a means of testing and improving theories of stellar evolution and structure. These and related programs made use of an updated catalogue of emission-line intensities and a large database assembled from observations at Kitt Peak, Cerro Tololo, and Steward Observatories, and with the International Ultraviolet Explorer. The Relation Between Chemical Enrichment and Core Mass in Planetary Nebulae. J. B. Kaler and G. H. Jacoby, Astrophysical Journal, 362, 419, 1990. A Catalogue of Absolute Fluxes and Distances of Planetary Nebulae. J. H. Cahn, J. B. Kaler, and L. Stanghellini, Astronomy and Astrophysics Supplements 94, 399, 1992. Narrow Emission Line O VI Planetary Nebula Nuclei, L. Stangehllini, J. B. Kaler, and R. A. Shaw, Astronomy and Astrophysics, 291, 604, 1994. Broad Emission Line O VI Planetary Nebula Nuclei, L. Stangehllini, J. B. Kaler, R. A. Shaw, and S. di Serego Alighieri, Astronomy and Astrophysics, 302, 211, 1995. Abundances in Local Group Planetary Nebulae, in Highlights of Astronomy, IAU, I. Appenzeller, ed., vol. 10, p. 480, 1995. Variability of IUE Spectra of the Pulsating Nucleus of the Planetary Nebula K1-16, W. A. Feibelman, J. B, Kaler, H. A. Bond, and A. D. Grauer, Publications of the Astronomical Society of the Pacific, 107, 914, 1995. [N II] and [O III] Electron Temperatures in Planetary Nebulae, F. C. McKenna, F. P. Keenan, J. B. Kaler, A. W. Wickstead, K. L. Bell, and K. M. Aggarwaal, Publications of the Astronomical Society of the Pacific, 108, 980, 1996. Spectrophotometry of Planetary Nebulae: III. IIDS Observations of Compact Nebulae, J. B. Kaler, K. B. Kwitter, R. A. Shaw, and L. Browning, Publications of the Astronomical Society of the Pacific, 108, 980, 1996. An Electronic Emission-Line Catalog for Planetary Nebulae, J. B. Kaler, R. A. Shaw, and L. Browning, Publications of the Astronomical Society of the Pacific, 189, 289, 1997. The Enigmatic X-ray Point Sources at the Central Stars of NGC 6543 and NGC 7293, M. A. Guerrero, Y-H. Chu, R. A. Gruendl, R. M. Williams, and J. B. Kaler, Astrophysical Journal Letters, 553, L55, 2001. CHANDRA Reveals the X-Ray Glint in the Cat's Eye," Y-H. Chu, M. A. Guerrero, R. A. Gruendl, R. M. Williams, and J. B. Kaler, Astrophysical Journal Letters, 553, L69, 2001. This page was last modified on 6 August, 2009.